You'll likely need a bottle of whiskey and a beer-back for this one, 'cause Murder By Death loves singing 'bout drinking. 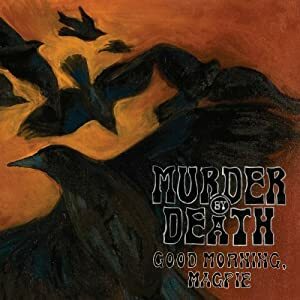 Honestly, I was a little bit down-trodden upon first listen of Good Morning, Magpie, simply because I was not initially drawn in by any particular track in the same way that I was drawn in by most of the tracks off of Red of Tooth and Claw. However, as many albums do, certain songs began to sink in and did more than an adequate job of chasing away my temporary disappointment. Additionally, I admittedly start listening to new albums from bands I love with expectations that are fashioned by my intimate relationship with records and tracks of the past, momentarily forgetting that bands typically move forward and evolve. I would say that MBD may have matured, but certainly not "moved on." Adam Turla's voice remains as old-fashioned and gritty as ever, the musicianship perhaps is more impressive, and the lyrics are still a tasteful mixture of melancholy & good, drunken times. I ultimately enjoy GM,M more than In Bocca Al Lupo but less than Red of Tooth and Claw, in general. "Foxglove," "King of the Gutters, Prince of the Dogs," "As Long As There Is Whiskey In The World" and "The Day" are my favorites and make for good starters, but as suggested above I'd grab a bottle or two and run through this one a few times so it settles in deep with your warm, whiskey buzz.